Hemstitching gives a secure and pretty edge for the fringe on this cotton throw. 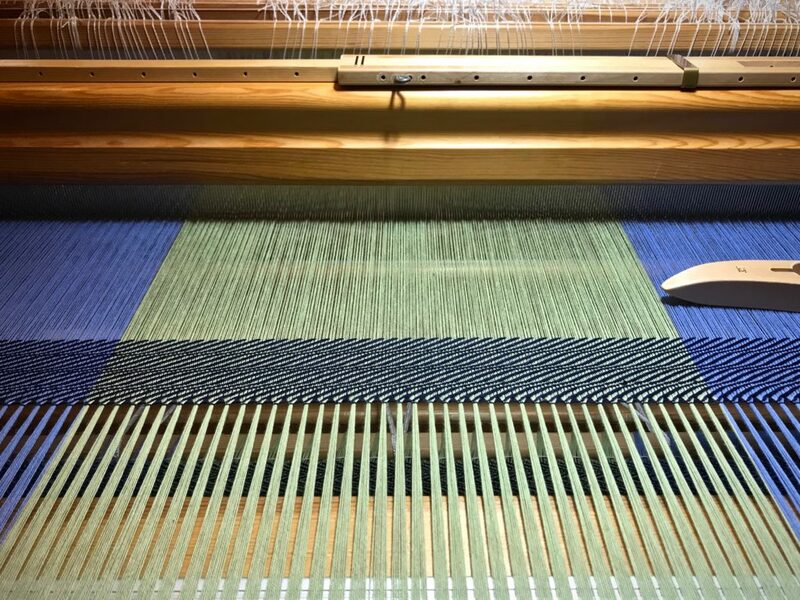 At the beginning of the throw, I measure out a length of the weft thread for the stitching. And now, at the end, I roll off enough thread from the shuttle’s quill to use for the final hemstitching. Wanting to finish, I weave the final few centimeters of the throw after dark. Mark on the measure tape shows I have woven to the end of the throw. I’m always afraid of cutting the length of thread too short. So, I measure off four times the width of the warp, with a pinch extra just in case. That’s too long, and I know it. But I do it anyway. And then, I have a very long thread to pull through every stitch, with the tangles and knots that go with it. Hemstitching thread is longer than needed. 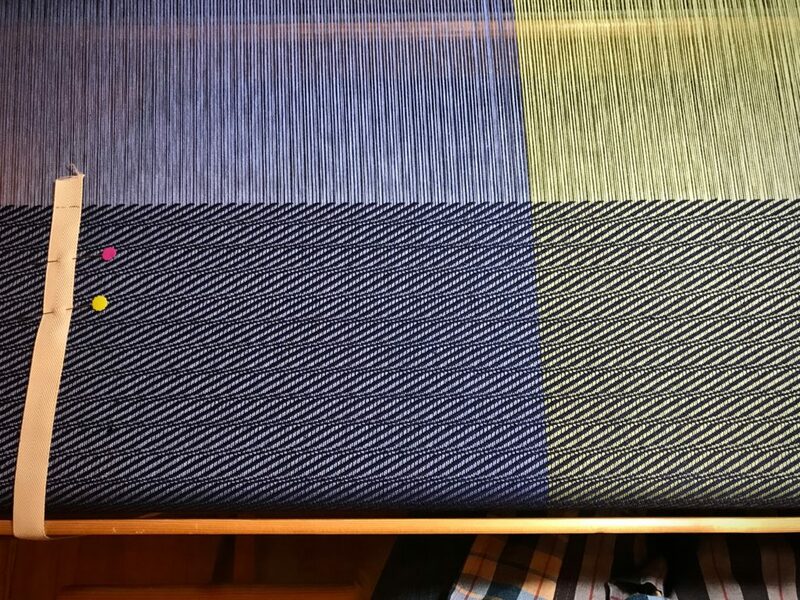 Three times the width of the warp should be plenty. In trying to be perfect, I miss perfection by a long shot. If I measure out more than enough of my own goodness, surely I’ll have plenty to enter heaven, right? But the perfection of heaven requires perfection. It’s impossible for me to be good enough, smart enough, or successful enough to reach perfection. Heaven is for the imperfect. We, the imperfect, enter heaven’s perfection by trusting in the only perfect one, Jesus Christ. His goodness, measured out for us, is precisely enough. May you know when enough is enough. That’s right, Joyce, His cross is our bridge. Amen and Amen! I also measure out way too much thread for hemstitching…knots and all! Thank you for sharing what Christ is to you – and wants to be to all of us! Transition. Changes. Adventure into the unknown. That describes 2018 for Steve and me. 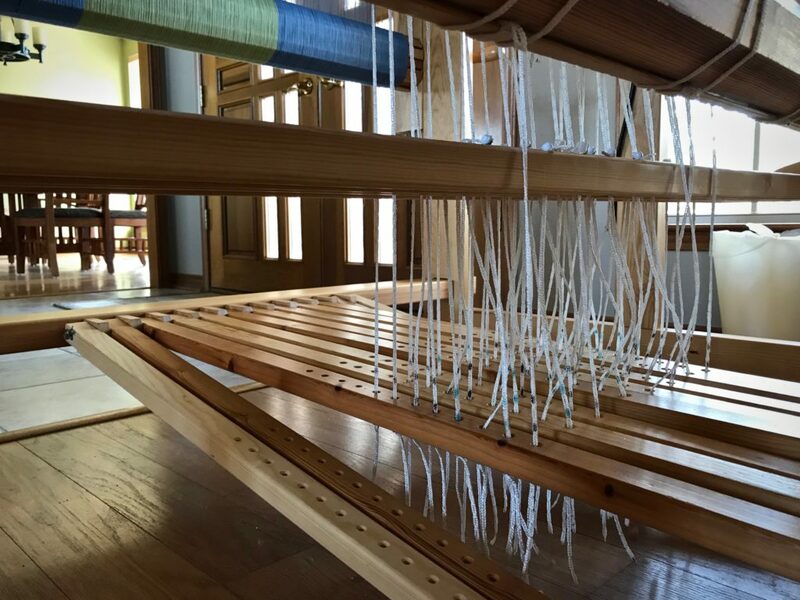 When I review my weaving history for the year, everything on the loom is attached to a memory. 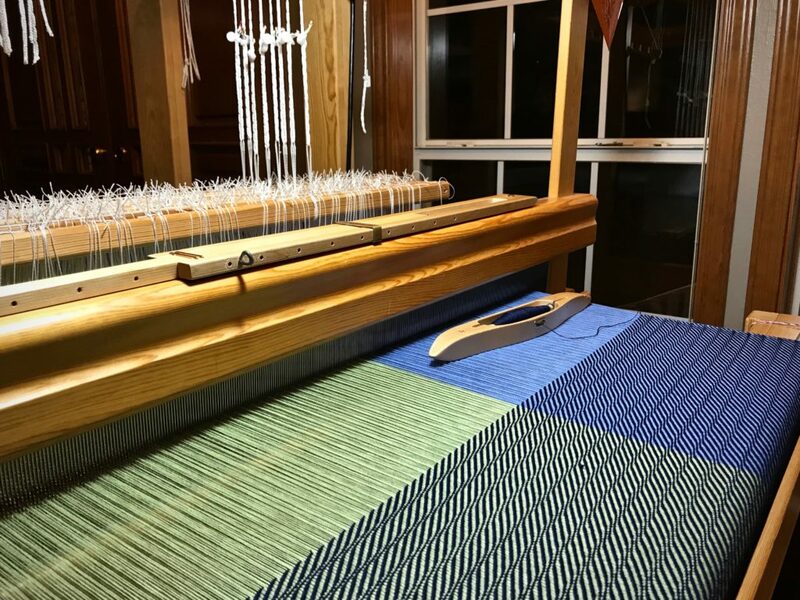 Like an old song that awakens our thoughts to past experiences, the Lizard tapestry certainly sparks in me revived memories of our transition season and the moving of looms. See Quiet Friday: Tapestry in Transition. Steve unscrews a bolster that holds one side of the warp beam so I can remove the warp beam. 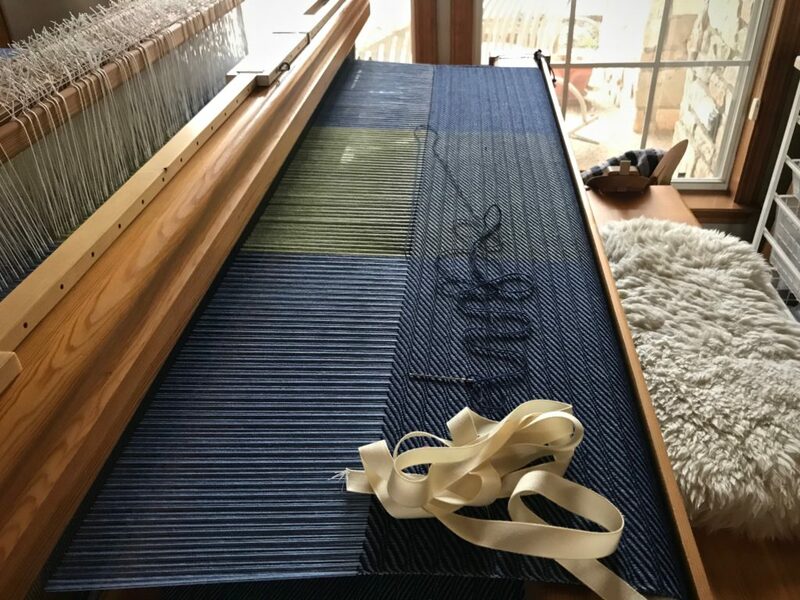 I began 2018 with a plan to weave coordinated fabrics for our Texas hill country home—towels, upholstery for bar stools, and placemats, explained in this post: Harmonized Weaving for the New Year. Accomplished! 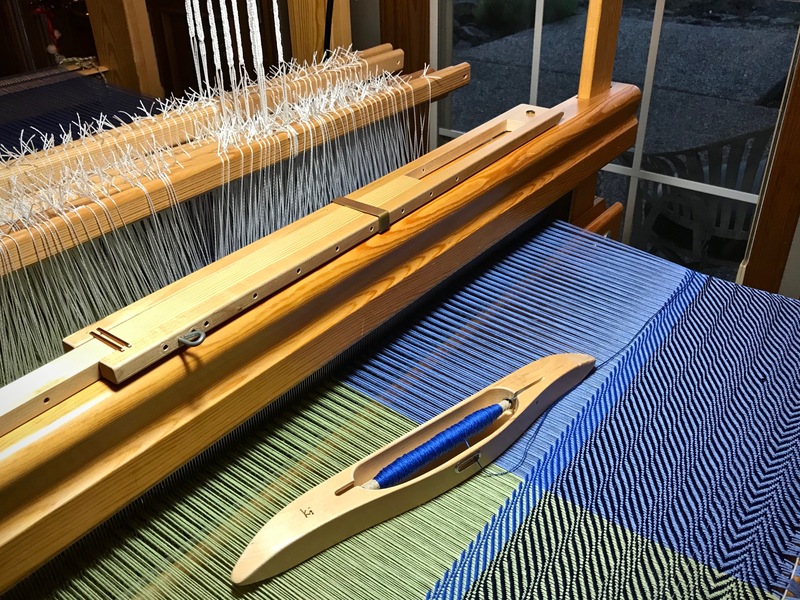 I also committed to weaving a gift for each of my three daughters (daughter and two son’s wives), as described in this post: Weaving a Gift. Accomplished two out of three! The final gift is nearing halfway on the loom right now. Cotton throw has hemstitching at the beginning. 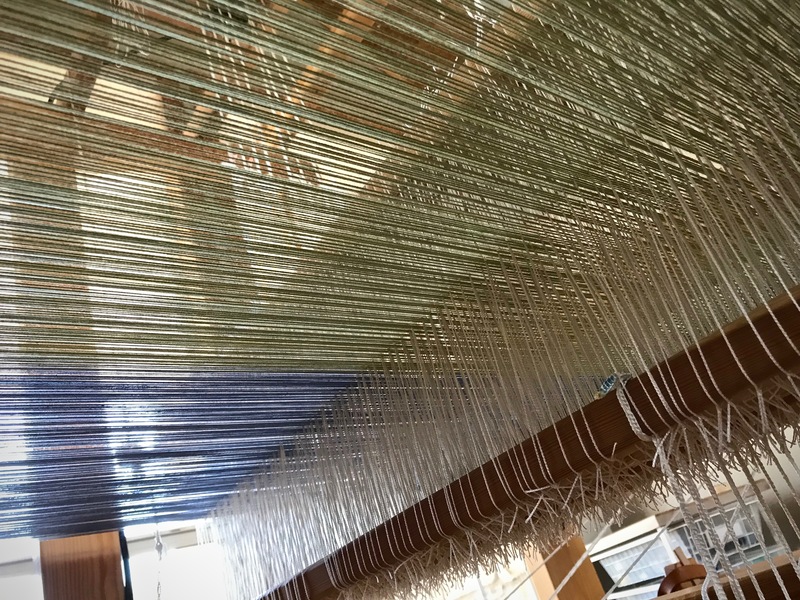 The ends will be twisted for fringe when it’s taken from the loom. Eight-shaft twill in an undulating pattern. 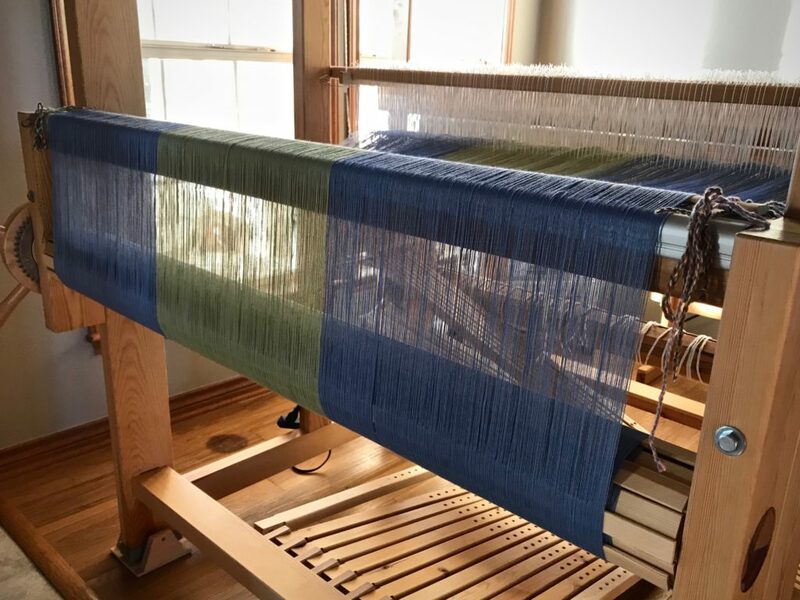 Single-shuttle weaving gets me off to a fast start for 2019. 2019 is a continuation of transition, changes, and adventure, as we tiptoe into this retirement chapter. 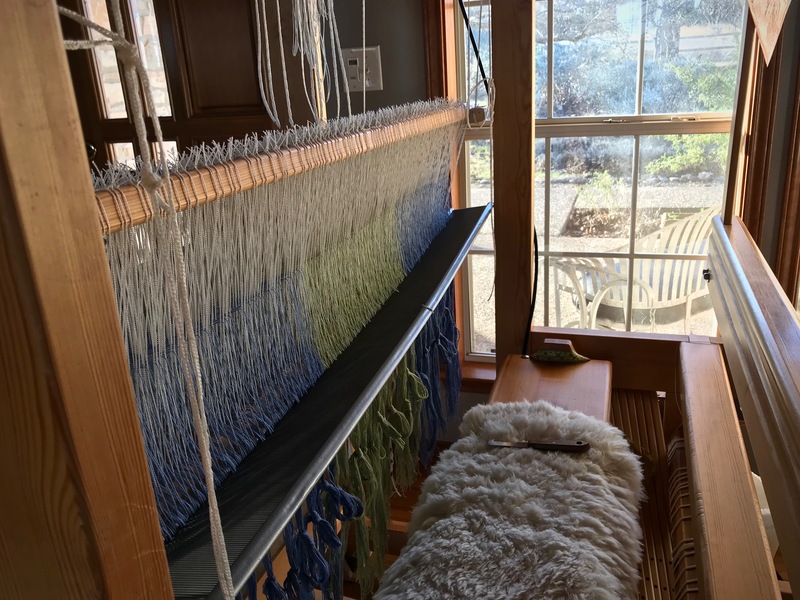 A drawloom is in the forecast, as well as some travel tapestry weaving, and more rag rugs, towels, scarves, and throws. And anything else we can think up. It’s going to be a good year! Thank you for coming along. I’m grateful to have you as a friend. May you have much to look forward to. You’ve had an exciting and productive year. Wishing you all the best in 2019 and beyond. Hi Beth, Thanks for your well wishes! Wishing you a great 2019 in every way! Hi Diane, It is wonderful to have fellow weavers like you on this journey with me. Learning new things is one thing I look forward to in 2019! Hi Ellen, It’s good to hear from you! I haven’t done undulating twill in cotton before, so we shall see about the shrinkage. I’ll be sure to mention it when I take measurements after washing. Hi Nannette, It’s a treat to get to share what I do and think with friends like you. I doubt myself when I start weaving something. But it’s a good time to question everything. The first twenty centimeters are designated for sampling. Is this the right sett? How is the weft density? What treadling order will I use? 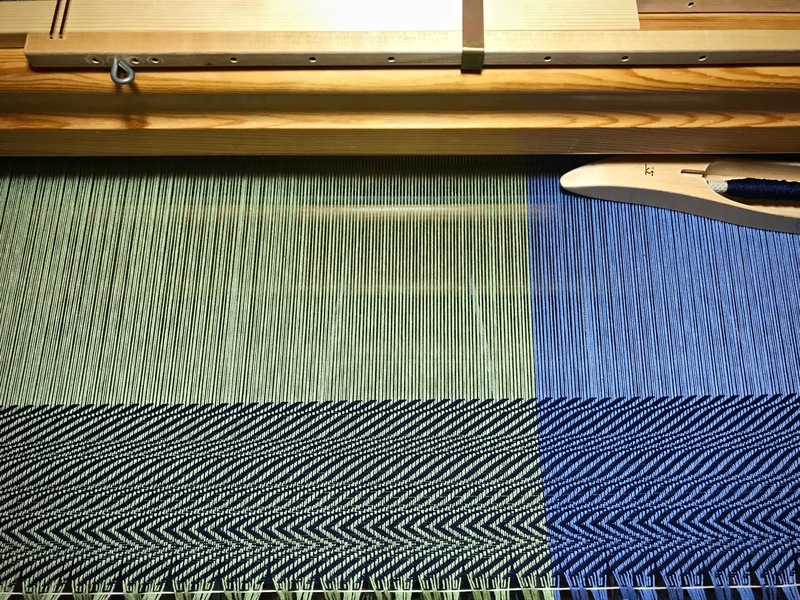 Which weft color(s) works best? 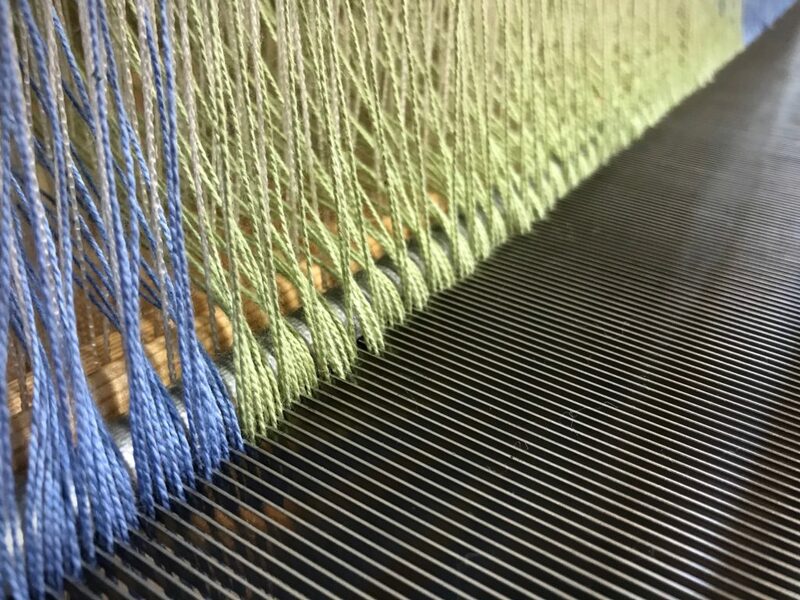 Trying out some treadling patterns for this cotton throw. 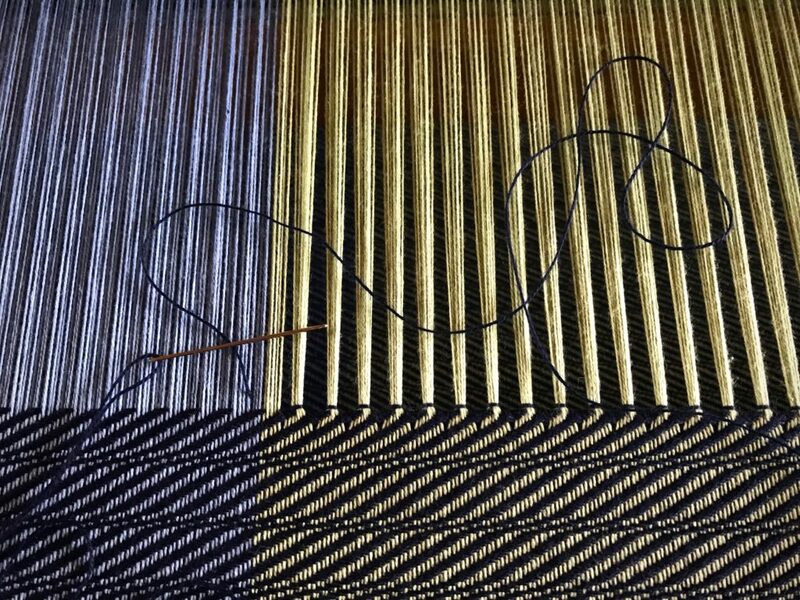 Undulating twill is planned. 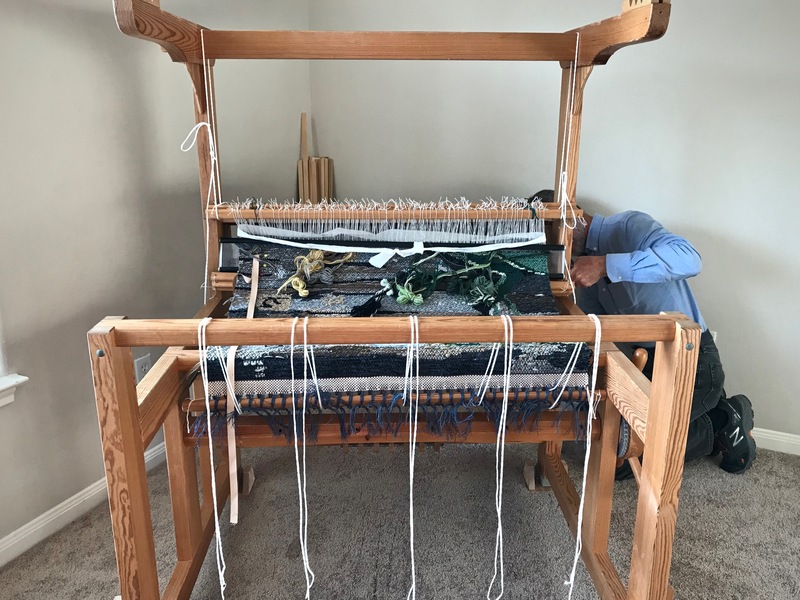 It helps to see it on the loom. I plan on paper, and get excited when I see a ready warp on the warp beam. But nothing is settled until I’ve passed the sampling tests. The plan on paper is what I think I want. 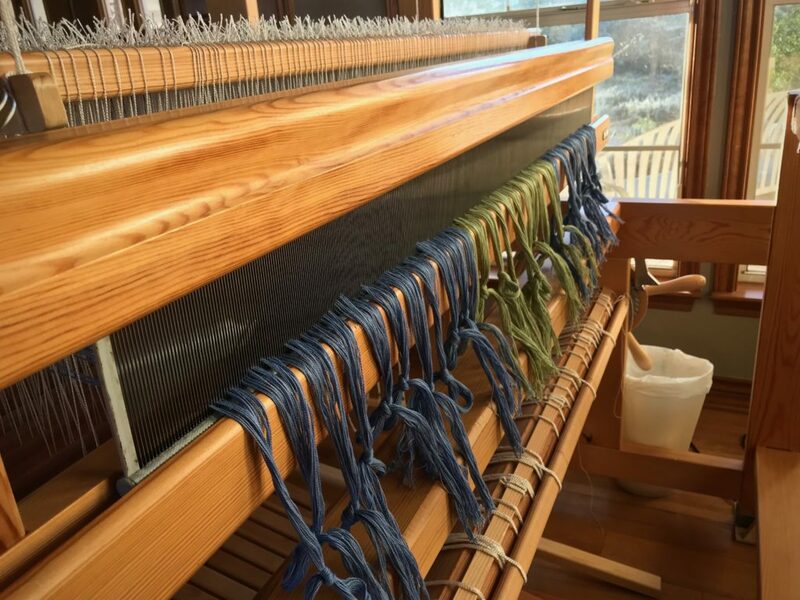 And then, unanticipated adjustments and changes are necessary at the loom. In the end, I expect the actual weaving to be better than my original plan. More sampling of treadling patterns. When we think we must have what we planned, we give up a better way. We lose our way when we insist on having our way. Jesus came to us as an infant (the Christmas message), leaving his rightful heavenly position. To follow Jesus is to deny myself like he did. Some of the testing means telling myself no. In return, I gain the life I could not see on my paper plan. May you give up some of your favorite plans. Hi Joyce, I’m so thankful for His immeasurable love! Beautiful! Both the sample, as well as your message of encouragement. I hope to get better at letting go of my ‘paper plans’ in life. Hi Anneloes, I’m with you on that. Sometimes I really cherish my ‘paper plans’ and forget the Lord has a better way. Hi Kelly, Thank you for the warm greeting! Life is what happens while we are making plans is a favorite saying of a dear friend. Your reflections on paper plans and letting go to follow Christ’s example coincide with that statement and remind me to follow Christ’s path and not my own. Blessings to you and yours as we follow the light of Christ during the coming year. Ruth, Your friend’s saying rings true with me. How much better to willingly let go of how we thought things should be, than to hold tightly to our ‘paper plans’ and miss the joys of living life to the fullest. What a relief that we have Christ to follow! Merry Christmas from the great white north. Hi Nannette, Merry Christmas to you! Thank yo Karen for sharing. I would have liked to have seen what your paper plans look like also, as they are part of the process. Your message is just what I needed. Hi Alison, I don’t think I have done a post on project planning. I’ll have to do that! My paper plans hold the calculations, yarns, draft, and other details. 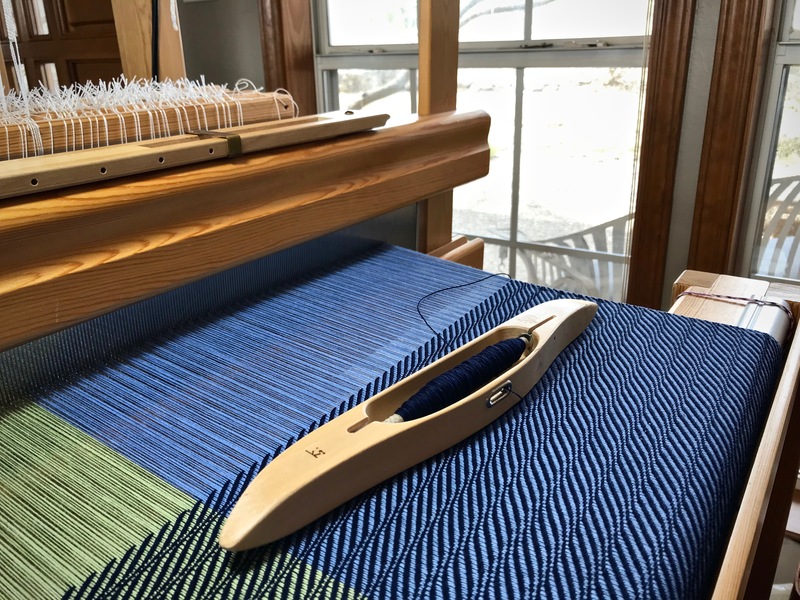 I always have that piece of paper close at hand as I dress the loom and weave. I’m glad to hear that you gained something from today’s words. Your reflections are such a blessing. Hi Linda, My reflections result from things I’m learning. I’m glad they mean something to you, too. 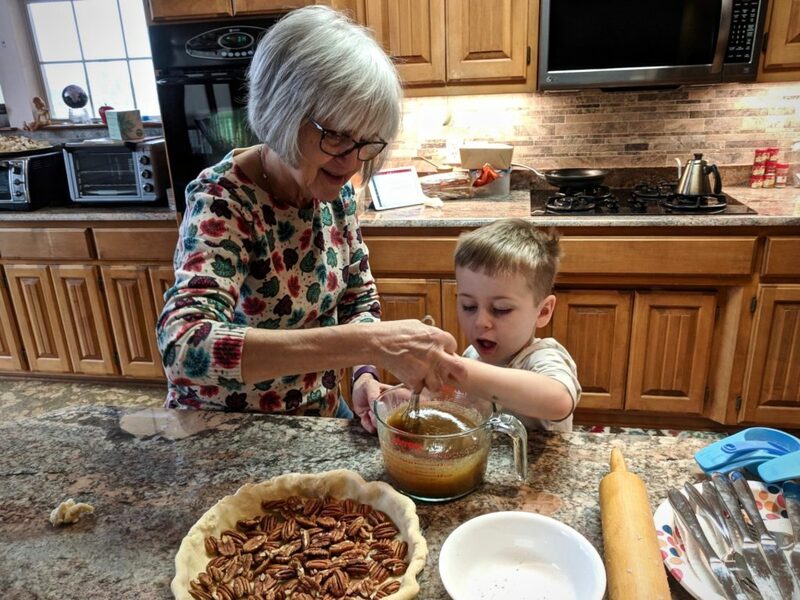 Before everyone arrives for our Thanksgiving family gathering, I am making pie crust for the pecan pie, dough for my “famous” cranberry bread, and doing the prep to make Gram’s turkey dressing. Each family is bringing their contributions to the meal (feast). Thanksgiving Day is a flurry of activity with too many cooks in the kitchen—just how we like it! And sitting at the table with the feast before us, we give thanks. Thanks to each other, and to our Creator. We are blessed! Thanksgiving feast prep. It takes two pastry chefs to make the perfect pecan pie. And before everyone arrives I also manage to sley the reed on the Standard. A different kind of dressing—loom dressing. Two ends per dent in a 45/10 metric reed. I sit “inside” the loom on my loom bench to sley the reed. After the reed is sleyed, I remove the loom bench, lower the shafts, and move the countermarch to the front of the loom. Then, I place the reed in the beater and make sure it is centered. Next step–tying on! Getting dressed. 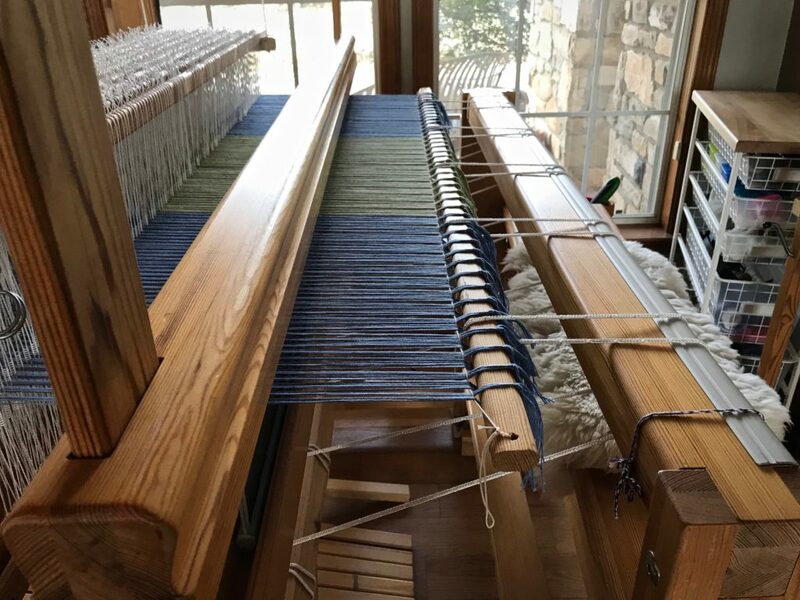 Oh the beauty of a fresh warp going over the back beam! Magical. A feast for the eyes and hands and heart. Thankful indeed! One more thing to be thankful for. People in the world who share their blessings. Good morning, Nannette, You’re welcome! And thank you for your sweet encouragement. Simply said, and so beautifully pictured. Your words inspire joy in life! Hi Sue, It’s quite possible that thankfulness is the very root of joy. Wow! How many ends is that? Hi Marjorie, This is 984 ends. 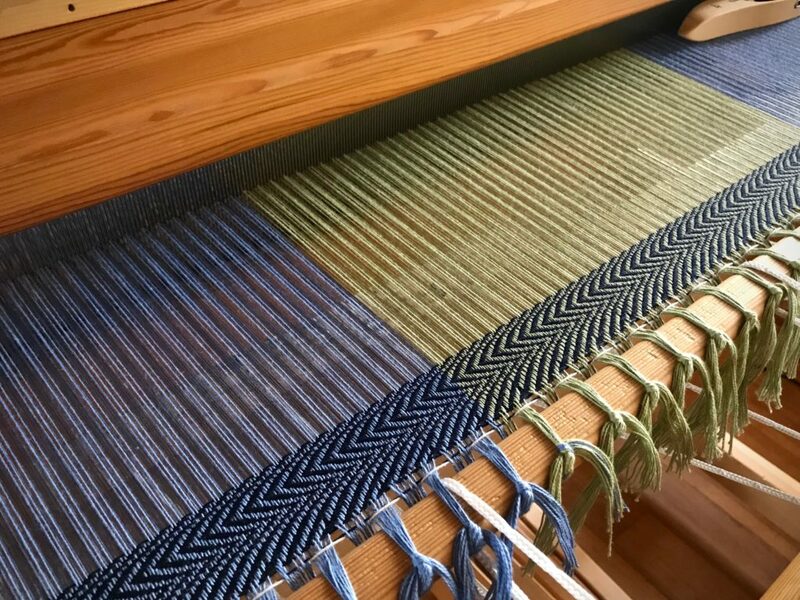 I wanted this throw to be almost the full weaving width of the loom. I am so happy that you had a Thanksgiving of family and good food, Karen. I imagine the pecan pie was all the sweeter for the help! Hi Annie, We treasure the time we have with family. That pecan pie came out really delicious. It didn’t last long. Yes, that kind of help is sweet indeed!